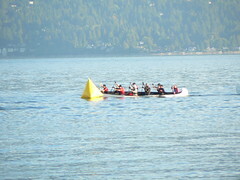 Gung Haggis paddlers come third in the UBC Day of the Long Boat – the largest voyageur canoe race in the world! America… maybe the world! 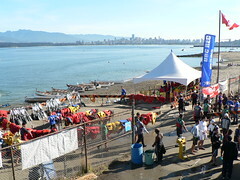 300 teams in the UBC Day of the Long Boat at Jericho Beach. But in our heat of races, we also beat 3 UBC Alumni teams and 2 Women's teams, in our final heat. We were the first boat racing a roster of 2 women & 8 men. and 2 Women's teams were in this first heat. first, or to get the better position. Samis steered the Gung Haggis Fat Choy boat, Tzhe was lead stroke. past another canoe that had come in beside them. heels. It was a tight race. Wow! switching strategies to deal with all the shallow water. the lead coming towards the beach. for the final turn to the beach. the boat. He ran up the beach and banged the gong with the baton. exhausted. We patted each other on the backs, and walked up the beach. Bytes Men's team was already on the podium congratulating each other. was nice to see them get the little black canoe trophies. teams on the way to the finish. We did the best we could. Now…. 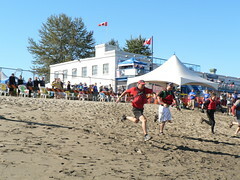 Ft. Langley Cranberry Canoe Regatta in 2 weeks. This entry was posted in Dragon Boat photos 2003, Dragon boat with Todd Wong - Dragon Boat Coach, Gung Haggis dragon boat team information, Main Page, Vancouver Area Adventures on September 29, 2008 by Todd. Ricepaper Magazine is the little magazine that could. It has outlasted many other Asian-American and Asian-Canadian magazines cover arts, culture and lifestyle. Primarily Ricepaper Magazine covers arts and culture specializing in literary topics. It originally started off as a newsletter for Asian Canadian Writers' Workshop, then made the transition into a nationally distributed magazine with content from across the country. In December 2007, ACWW went through a board transition and entered 2008 with a brand new board of directors including myself -Todd Wong as co-president with Leanne Riding. Joining me on the executive were Ann-Marie Metten as secretary. Brian Lam and Ted Alcuitas as vice-presidents. There are many very interesting articles in the brand new 13.3 issue of Ricepaper Magazine features articles on author Roy Miki by Alan Cho, architect Bing Thom by Victor Liang, “Losing Ground: The Humanity of the Three Gorges” by Andrea Warner, author Andy Quan by Alan Woo, photographs by Evan Lee, An Orientation to Colourschool: How to Un-name a colour by Liz Park, Precious Cargo by Emily Khong, plus many more articles and features. case, it'll be easier to flaunt as a highbrow fashion accessory. This entry was posted in Main Page on September 29, 2008 by Todd. Madeleine Thien and a grant from the Canada Council. Cernauskas and pianist Rachel Iwaasa. inspire them to their own greatness. out page 77 of the Sept 18-25 / 2008 issue of the Georgia Straight. years to come. More info is available at www.kogawahouse.com/ . This entry was posted in Literary Events, Main Page, Multicultural events, Vancouver Heritage and History on September 28, 2008 by Todd. a diverse Vancouver City Council. It was a very happy party for the Vision Vancouver nominations results party last night at Science World. It was great to see so many faces that help make Vancouver such as vital and creative city. People like Naomi Singer – creator of Winter Solstice festival and Paul Wong – video artist, as well as Paul Faoro- president of CUPE 15, and Alex Youngberg – president of CUPE 391 Vancouver Library Workers. And I happily made a new friend with Jennifer Sweeney, who is Director and Co-Chair of the Campaign School for Canadian women Voters Congress. I went down to check out the action at Tupper at 6:30pm, and saw many candidates and supporters all greeting the incoming voters with flyers. It was like a Chinese night market as people called out “vote for (fill in blank), hawking their preferred vote. I was greeted by Kerry Jang, Raymond Louie and Andrea Reimer – 3 of the councilor candidates that I gave personal endorsements to. Then a nice enthusiastic hug from Constance Barnes who is running for Parks board. I know Constance from her job as manager at the Dr. Sun Yat Sen Classical Chinese Gardens. She is a warm friendly person whom whenever I talk with, I know I want to get to know her better. After voting from 10am to 7pm at Charles Tupper, the candidates and their support teams all headed to Science World expecting results announcements for 10pm – just in time for the late evening news. I arrived after 9:30pm, to a very festive atmosphere. People were dancing beside and on the stage. Lots of greetings as new people constantly arrived. Warm hugs from Aaron Jasper, Parks candidate and his wife Arminder – they both were volunteers at the 2008 Gung Haggis Fat Choy dinner this year. I got to know Aaron during the Vancouver Civic Strike last year when he would bring water to our Library Square strike line. It was great to see my old friend Sarah Millin and Imtiaz Popat from my Canadian University Press Days. I met the newly nominated Vancouver Fairview MLA candidate Jenn McGuinn, and discovered we knew many people in common. There were also people from the Green and COPE parties attending. My friend Stuart Mackinnon, the newly nominated Green parksboard candidate, introduced me to Ben West, Green Party chair. And I bumped into Green organizer Tom Cornwall who used to paddle on Gung Haggis dragon boat team many years ago. Another former Gung Haggis paddler was Meena Wong, who is seeking the councilor nomination for COPE. COPE school board nomination candidate Jane Bouey was also there. This event was also very family friendly. Children and adults were all playing with the different Science World displays. Andrea Reimer's young daughter was on stage dancing with Andrea. Kerry Jang's daughter was running and playing with other children. Raymond Louie's daughter was walking around with her mom. But there were delays as they counted votes cast by a record number 4,500 people. And then there was a recount, as results for the last spots for council and school board were separated by only 17 and 8 votes respectively. Mike Magee came to the stage just before 12 midnight to announce the results. Incumbent councilor Raymond Louie topped the votes, as all incumbent Vision councilors Heather Deal, Tim Stevenson and George Chow were easily nominated. Andrea Reimer led the polls for new council candidates followed by Geoff Meggws, Dr. Kerry Jang and Kashmir Dhaliwal. Geoff Meggs and his family were standing behind me when the announcement was made, and they were all very happy. Heather Deal was standing in front of me and soon handshakes and hugs were congratulating all the winners. encouraging the skate board enthuiast to try out dragon boat paddling. I almost had Aaron and his wife Arminder in the dragon boat, after they volunteered for the Gung Haggis Fat Choy dinner back in January. I am sure that Constance and I will be planning a joint event at the Dr. Sun Yat Sen Gardens in some form. Winning School Board nominations were Sharon Gregson, Mike Lombardi, Patti Bacchus and Ken Clement. Clement hopes to be the first aboriginal trustee on the Vancouver School Board, helping to bring more diversity and recognition for First Nations issues. This entry was posted in Main Page, politics and politicians on September 21, 2008 by Todd. Gung Haggis dragon boaters climb Grouse Grind in less than an hour. Team members from the Gung Haggis Fat Choy dragon boat team have been regularly doing the Grouse Grind in North Vancouver this year. We started as a team event two years ago on Canada Day, and repeated last year. This year, team members have been making regular treks up the Grind to improve their times and their fitness. The following report is written by Dave Samis. Photos by Dave Samis. back to that staircase from Hell for another go at it. resumed when we were on the stairs. Hillary above going up and up without a rest. out 8 minutes to go. at 59.5 minutes – just under the hour. 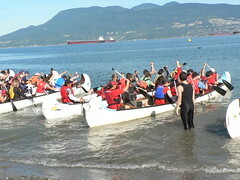 This entry was posted in Dragon Boat photos 2003, Main Page, Vancouver Area Adventures on September 21, 2008 by Todd. Redress for the WW2 internment of Japanese Canadians is one of Canada's most significant actions to address Canada's past racist history. Highlights include panel discussions on related topics, plus music and performances by dancer Jay Hirabayashi, and poets/authors Roy Miki and Hiromi Goto. Host Venue: Vancouver Japanese Language School and Japanese Hall, Vancouver, B.C. It was the 6 year old Canadian-born Generation Joy Kogawa that was put on a train in 1942 and sent with her 10 year old brother, Anglican priest father and mother, to the internment camps in the Kootenays. This was done in the wake of Japan's bombing of the US naval base Pearl Harbour in Hawaii, and fears of a Japanese invasion of Canada's Pacific coast. But no similar action was done against German ancestry descendants. All Japanese-Canadians on the coast were sent to internment camps, and while there they suffered the indignity of having their houses and properties confiscated and auctioned off, supposedly to help pay for their internment. The anti-Japanese racism extended years beyond WW2, as Canadian parliament enacted a dispersal policy, to restrict Japanese-Canadians from returning to the West Coast, sending them instead to work on beet farms across Canada, or to be “re-patriated” to Japan – even if they were born in Canada! In 1988, Prime Minister Mulroney signed a redress settlement with Art Miki, and made an apology in Parliament. This redress process also set in motion a redress movement for the Chinese Head Tax, when NDP MP Margaret Mitchell brought the issue to Parliament in 1984. In 2006, Prime Minister Harper officially apologized for the Chinese Head Tax (initiated in 1885) and Chinese Exclusion Act (1923-1945), but failed to give a redress payment for all head tax certificates, whereas all Japanese-Canadians born up to 1947 were eligible for redress settlement. 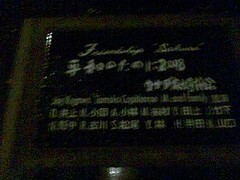 I have been privileged to be involved in the struggle to save the childhood home of Joy Kogawa from demolition. Kogawa's novel Obasan brought the Japanese-Canadian internment and struggle for redress to Canadians through literature. NDP leader Ed Broadbent read a passage from Obasan in the House of Commons during the 1988 Parliamentary redress. those individuals who took a major role in the Redress Movement. the conference and details on registration. This entry was posted in Asian Canadian Cultural Events, Chinese Head Tax issues + Gim Wong's Ride for Redress, Joy Kogawa & Kogawa House, Main Page, Multicultural events, Upcoming Events on September 20, 2008 by Todd. The UBC Day of the Longboat is the largest voyageur canoe race in North America. Take over 100 teams of university students, staff and community teams, give them one canoe orientation clinic, then put them on the water in heats of ten for a bumper car style race start. It's crazy! 10 voyageur canoes race towards a single buoy to turn right, The Gung Haggis team is in the foreground. Todd is steering. Kristine is lead stroke. photo Dave Samis. The community team event is on Sunday Sept 28th, so this weekend we will do an orientation in the voyageur canoes. The Gung Haggis Fat Choy dragon boat paddlers first entered this race supplementing the Tacoma DBA team in 2004.
carrying their baton and run up the beach to hit the gong. Sunday 1:30 Gung Haggis dragon boat practice. more people had challenges meeting the 10am morning time. Weather is getting colder too. 4pm – same as last year. We have more men than women wanting to do long boat this year. the boat. We will certainly surprise them with Gayle and Pash! person voyageur canoe, while English Bay waves bounce you up and down. students as there are over 100 teams. This entry was posted in Dragon Boat photos 2003, Dragon boat with Todd Wong - Dragon Boat Coach, Gung Haggis dragon boat team information, Main Page, Upcoming Events on September 19, 2008 by Todd. NBC discovers Vancouver has ethnic non-white actors – Diversity lives in Vancouver!!! For generations, Asian Canadian actors have been relegated to ethnic roles, and supporting characters. Think of Robert Ito (Japanese-Canadian) in Quincy, George Takei in Star Trek, The Hop Sing character in Bonanza. Here's a Casting Call for Actors of Colour – forwarded to me from Joyce Lam of Vancouver Asian Canadian Theatre. Please feel free to forward to anyone you know who may be interested. NBC UNIVERSAL OPEN CASTING CALL! East Indian, African American, First Nation, Asian and Latino actors. This entry was posted in Main Page on September 17, 2008 by Todd. Story Telling Our Lives: Stories of Migration and Displacement – presented by No One Is Illegal and newworldtheatre. Storytelling + Theatre + Human Rights = something compelling? This project has been facilitated by Carmen Aguirre. This entry was posted in Main Page, Multicultural events, Upcoming Events on September 15, 2008 by Todd.